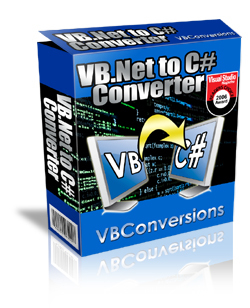 There are a number of VB .NET –> C# converters out there, but we ultimately decided to use the VBConversions VB .NET to C# Converter because it offered the fastest, easiest, and highest quality conversion of any of the tools that we evaluated. We intensively tested 6 products...this is absolutely the best tool for the job. I would like to commend your company on your excellent service. Your turnaround time for responses are so appreciated. We have and will recommend your product and company to any shop dealing with converting VB.net to C#. I've used your VB.Net to C# Converter product since 2005 and find it to be one of the best software investments I've ever made. I recently needed to convert about 6000 lines of code. I purchased this converter and I can say that it is a great tool. Even though I used this tool only once, it was well spent money. Keep up the good work. I really love your software. Its works fantastically well. Are you ready to convert your VB code to C#? All versions of Visual Basic.Net are supported: 2003, 2005, 2008, 2010, 2012, 2013 as well as all project types (Win Forms, Web, Class Library, Compact Framework, Silverlight, etc.). There is support for the latest VB.Net language features, including VB2012 await/async support, VB2010 enhancements like Implicit Line Continuation and Multiline Lambdas, and VB2008 features such as LINQ and inline XML. Download the trial edition for free and check it out. There is absolutely no hassle or nagging emails and no registration is required. Support for the latest Visual Studio features - The latest VB.Net / C# features are supported, including Await/Async, Implicit Line Continuation, Multiline Lambdas, Nullable Optional Parameters, LINQ, XML, WPF, Lambda expressions, and extension methods. This release was tested on 7,946 VB.Net projects and produced 6.5 million lines of C# code. All converted without compiler errors. Read more about our testing process and results. Unnecessary ByRef Parameters (common in upgraded VB6 projects) automatically changed to value parameters (this can optionally be disabled). Of course, this is a small sample of what the VBConversions VB.Net to C# Converter can do. Download the trial edition and see how well it does on your code! There is no obligation and no registration required. In line XML w/"code holes"
VBConversions was mentioned in a prominent MVP blog, for its unique ability to convert LINQ. The VBConversions VB.Net to C# Converter won the 2006 Visual Studio Magazine's Readers Choice Award in the Development Tools Category, and has received multiple nominations thereafter. Your application worked great the very first time unlike my experience with (competitor name omitted) which does not do spit with the designer file and made a mess out of the conversion of the remainder of a functioning vb.net application. I'll be recommending your application to anyone else I run into that may be attempting to move from vb.net to C#. You've earned my confidence! I just downloaded your trial software and all I can say is wow! Great software! Keep up the great work. Being in the industry as long as I have I have seen a lot of bad software both in the corporations as well as with vendors. It has always been a pleasant surprise to find something that simply works as well as advertised. We had nearly 50 MB's of VB.Net code to convert. The code effected many development teams in different departments within the enterprise. We intensively tested 6 products, and VBConversions' VB.Net to C# Converter had the richest feature set, reporting tools, analysis and recording options. All things considered, this is absolutely the best tool for the job.